An absolutely clean, excellent and a very responsive wordpress theme that is ever ready that can be used for any blog to turn it into a viral content magazine. 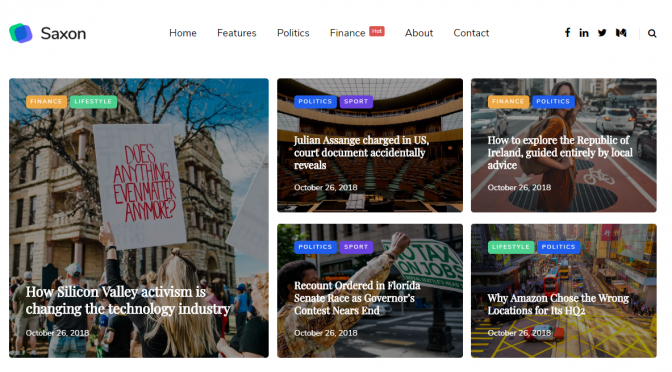 The theme saxon viral content blog and magazine wordpress theme can help you build a blogging site with simple steps and real time wordpress customization and 15 homepage blocks by dragging and dropping the features. You can change the layout and styles by creating unique feel and appearance. There are 11 available blog layout listings are available to show your posts you can customize the theme with multiple theme settings with the real preview in wordpress customizer. The navigation within the viral posts without reloading with Ajax load with more features. By importing a demo website with a click saxon viral content blog and magazine wordpress theme has myriad features for it. You can welcome the new era of blogging with this amazing wordpress theme for creating content powered by Gutenberg WordPress visual posts editor with default editor in WordPress 5.0 and Homepage Blocks Builder. Saxon WordPress theme can help you build any given content site that you want to build but find it hard to execute your plan from a simplest to a complex one such as a personal blog, magazine, file catalog, media catalog or just any website with a few clicks. There is absolutely zero need for any coding it is all about drag and drop. This incredible theme is packed with latest features which are unique and very trendy that gives you website a definitely new flair to be noticed by the customers or visitors by giving you the freedom of choice and unique characters. It is completely customizable, responsive and very mobile friendly to curate unfailing content to keep the visitors on your site for hours. A team stays at your service round the clock for support by just providing a confirmed email address you can get immediate help. Just install saxon theme with a single click and import all the demo data and pages, inject your style and let your contents be explored by the world. With Gutenberg content editor and drag and drop options you can get anything done within few minutes. You have around 15 homepage blocks to choose from various styles, position and combination to get a superb site such as posts, content blocks, sliders, categories and anything that you want. Each block can be used multiple times in any position and the posts can be assigned to groups to display any block on your homepage. Give it a perfect finish by going through all the available features that come free with saxon viral content wrdpress theme and set up a magazine site. In order to upgrade your theme to latest released version just add new and replaces changed files. Saxon WordPress Theme is compatible with WordPress 4.x-5.x, WooCommerce and WPML. And we make sure it will work with any future WordPress releases. You can use the support system for any saxon theme related questions, but make sure that you have read latest template documentation. Download BuzzFeed script. Do not download nulled BuzzFeed script from torrents or illegal sites. It's illegal. Always buy scripts from original developers.